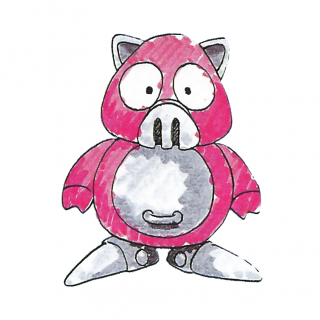 Ball HogMedia:Sonic1 MD US SonicJam manual.pdf, called Ton-ton (トントン) in the Japanese manualMedia:Sonic1 MD JP manual.pdf, is a pig-like Badnik found in Scrap Brain Zone (both the 8-bit and 16-bit versions) that hops on the spot and throws balls which bounce downhill. They can be easily destroyed by jumping. "Ton" is a prefix used to identify several Japanese pork dishes. Ball Hogs return in the Wii U/PC version of Sonic Lost World, with a cartoonish redesign unlike its original appearance. There are common variants as well as large silver and gold variants. They appear in Frozen Factory Zone 4, Silent Forest Zone 4 and Sky Road Zone 4. Their attack pattern remains the same as their original appearance, and easily destroying it requires only a Spin Jump or a focused Homing Attack. The gold variants are larger and must be dealt with in a different way by waiting for it to release a bomb encased in a gold shell, then kick the bomb back at them. Silver variants only appear in Silent Forest Zone 2, and will jump from the background to destroy platforms. They return in Sonic Mania, but this time in one of the brand-new zones, Titanic Monarch Zone, with a new coloring consisting of red, yellow and silver. Their attack pattern is the same as their original appearance. Ball Hog in Sonic the Hedgehog (16-bit). Ball Hog in Sonic the Hedgehog (8-bit). This page was last edited on 28 September 2018, at 15:26.